Rotary is helping to provide clean water and sanitation around the world. 2.1 billion people around the world are without safe drinking water in their homes. One of Rotary International's priorities is to provide clean water, and Ottawa River Coalition Coordinator Beth Seibert told us that since 1990 over 2.6 billion people have gained access to improved drinking water, and that if we continue to work at it, the rest of the world could have safe drinking water in our lifetime. The Lima Rotary Club has contributed to the effort with water and sanitation projects like the one we just completed in Honduras. When people have access to clean water and sanitation, waterborne diseases decrease, children stay healthier and attend school more regularly, and mothers can spend less time carrying water and more time helping their families. World Water Day is March 22, and Seibert encouraged all of us to unite and take action to create lasting change – across the globe, in our communities, and in ourselves. Also at Monday's meeting, the winner and runner of up of the Four-Way Test Speech Contest presented their winning speeches. Winner Riley Iiames from Bath High School encouraged people to use the Four-Way Test to honestly assess their insecurities and improve their self esteem. Runner-up Xylon Payne-Greeno asked us to use the Four-Way Test to determine whether we are contributing to global warming. Xylon will present his speech at the district competition in Van Wert Saturday in place of Riley who is unable to attend. The Equestrian Therapy Program isn't just pony rides. The Equestrian Therapy Program is creating miracles every day. Executive Director Michelle Andrews-Sabol told us that ETP is currently providing therapy horseback riding to 83 people every week. Riding a horse moves the client's muscles in the same way they would move if the person was walking, helping stretch and limber the muscles. Physical therapists help their clients do exercises on horseback, building strength and balance. "One trip around the ring is the equivalent of working on eight pieces of exercise equipment," says Andrews-Sabol. Clients also receive emotional benefits from bonding with the horses. "Our horses have done so many special things for our riders. We've had non-verbal autistic children say their first words on there. That is the first words the parents have heard their children say. One of our volunteers was in a wheelchair and could not walk. She went from a wheelchair to arm crutches to running along beside a horse and becoming an instructor herself. That's the kind of miracles that happen out there." ETP currently has 19 horses and is about to acquire a 20th - a 17-3 hand Belgian/Quarter Horse cross named Peanut. "He is extremely quiet. For a lot of our riders, he will fit them well, and I hope that he will be part of our program for a long time." Andrews-Sabol encouraged everyone to attend ETP's Kentucky Derby Party on May 4 which is a major fundraiser for the organization. Johnny Appleseed Parks Director Kevin Haver provided an update on the expansion of the Rotery Riverwalk from Roush Road through Country Club Hills to the OSU/Rhodes campus. They are meeting with affected property owners for right of way access and Haver says so far, things are positive. He also told us that the All People's Trail at Kendrick Woods has been removed and as soon as the weather improves it will be rebuilt. The 1/3 mile handicap-accessible trail is more than 30 years old and was deteriorating. The Lima Rotary Club donated $5,000 to the project. Also at Rotary, President Paul won the PolioPlus auction for 4 tickets to Crafton Beck's final concert with the Lima Symphony Orchestra with a winning bid of $100. Here are the highlights from the joint meeting of the Boards of Directors of the Lima Rotary Club and the Lima Rotary Foundation on March 12, 2019. Swartz called the meeting together at 11:35 AM with the following Rotary Board Members present: Ken Dysert, John Ficorilli, Susan Hubbell, Jed Metzger, Tracie Sanchez, Catheryn Sarno, Theresa Schnipke, Jeff Tracy and Secretary Rita Brown. Also present from the Lima Rotary Foundation: Elizabeth Brown-Ellis, Jay Begg, Drew Fields, Linda Hamilton, Jeff Unterbrink, Andy Wannemacher, Leslie Fry, Beth Seibert, Joe Watson and Treasurer Jared Walsh. Brown shared the February 2019 attendance report. The month ended with 167 members. There were no new applicants with three members resigning. Attendance for the month was at 40.88% - up from the previous month. Brown also shared reports on the makeup of the membership in the following categories. Years of Service: under 1 year 2%; 1 – 5 years 33%; 5-10 years - 19%; 10 - 20 years; 25%; more than 20 years - 20%. The Small Project Committee is currently working with Habitat for Humanity. They will also partner with the Red Cross in a Smoke Alarm Project. The project is part of the American Red Cross National Project. Volunteers will work alongside the fire departments and other local groups to install free smoke alarms, replace batteries in existing ones and educate families about fire prevention and safety. 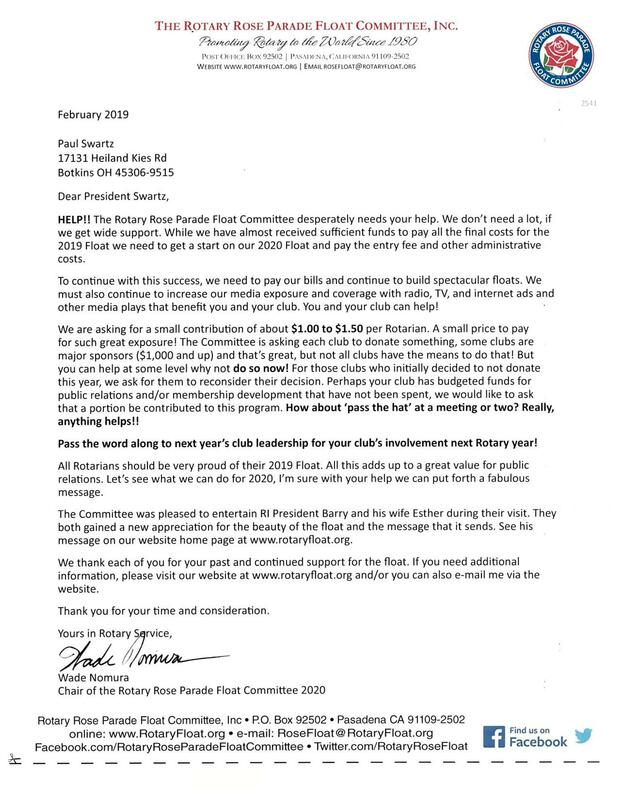 The club is on track to receive the Presidential Citation again this year. District Conference May 10-12 Kalahari Resort If interested, go on district web site and sign up. Swartz reported hearing from the Johnny Appleseed Metropolitan Park District Manager Kevin Haver. The materials for the Boardwalk cost more than originally thought. Total cost for the Boardwalk will be $25,000. Swartz suggested putting in a grant request for $5,000 at the next Foundation Meeting. Walsh suggested the additional request of $5,000 be made part of the Annual Meeting. Walsh will speak with Attorney Don Witter before the Annual Meeting about the possibility of using funds from the Hulsken Account. Lines of credit in the Foundation’s name were established at Superior and State Bank, totaling $320,000, which facilitated the purchase of the land for the amphitheater project. In addition to grant activity, the Foundation has revised the Code of Regulations and will present that for ratification soon. They are also undertaking a review of the Investment policy, which was last updated in 2000. Lines of Credit have been established with Superior Credit Union and State Bank in the amount of $320,000. Walsh shared a Transactions by Account for the Amphitheater Land that totaled $478.503.20. He stressed the importance of the Fund Raising to cover this cost so The Rotary Foundation does not have this amount of debt. Hubbell made a motion to approve the reports of the Foundation President and Treasurer. Hamilton seconded the motion. Boards approved. As Bill was not present, Sanchez presented the following report for the Rotary Club. The checking account at Superior Federal Credit Union has a balance of $24,380.42 and all liabilities are paid down. The Polio Plus liability will be paid to Rotary International by the end of the month. Wannemacher made a motion to approve the report as submitted. Dysert seconded the motion. Boards approved. The Annual Meeting will be held on April 22, 2019. Swartz and Dysert will be organizing planning meetings with Brown-Ellis and Wannemacher. Dysert just returned from the two-day President Elects’ Training. Rotary Connects the World will be the theme next year. The sessions included Break Out sessions with clubs of similar size. Dysert complimented members of the Board and The Club on all that the Lima Club has done or is doing. Dysert has been proactively filling the 32 Committee Chairs for next year and stated the response has been great. Almost all are in place. Dysert’s goal is to keep the club vibrant. Currently $3,800 has been raised for Polio Plus which is behind goal. The auctions will continue until the end of March. He has a goal of growing membership and is looking for options for the members to get involved. The Social Committee is looking at other options that will allow member involvement. The Young Professionals are also being involved. Alberta Lee resigned in January 2019 due to family member health issues. She has now requested returning to the club as an active member. John Guagenti, First Insurance Group – Benefits Consultant - sponsored by Dave Frost and Drew Fields. Heather M Jordan, Huntington Corporate Membership. Hamilton made a motion to approve the request of Alberta Lee to rejoin and to approve the applications for membership of John Guagenti, Richard Kortokrax and Heather Jordan. Seibert seconded the motion. Board approved. Brown-Ellis made a motion to accept the three resignations with regret. Hubbell seconded the motion. Board approved. Wannemacher discussed the upcoming Rex Perry Golf Outing and stated plans are underway. The meeting ended with general brainstorming on ways to improve the club! It was decided to add this feature to future joint board meetings. There being no further business, Swartz adjourned the meeting at 12:51 PM. Have you contributed to PolioPlus yet this year? You're encouraged to donate at least $25 a year to help eradicate this crippling disease. Lima Rotary's effort to provide clean water and sanitation is featured in this Foundation Minute. Clean water, sanitation, and hygiene education are necessities for a healthy environment and a productive life. When people have access to clean water and sanitation, waterborne diseases decrease, children stay healthier and attend school more regularly, and mothers can spend less time carrying water and more time helping their families. Lima Rotary began its efforts with clean water in 2007 in Las Navarrete’s, El Salvador, in 2008 Lima Rotary began its efforts at clean water in the Merendon Mountains just NW of San Pedro Sula, Honduras. In 2009 we began the water tower and distribution system in Choloma, Hn. In 2014 TRF began research on Water Sanitation and Hygiene. Lima Rotary was one of the first clubs to take advantage of this research incorporating the information in to our efforts to produce sanitation units in the Merendons. This effort was a forerunner to the current Rotary Foundation effort called WASH.
2030 is the year Rotary hopes to finish providing everyone with safe water, sanitation, and hygiene. Your contribution to The Rotary Foundation enables this to happen. 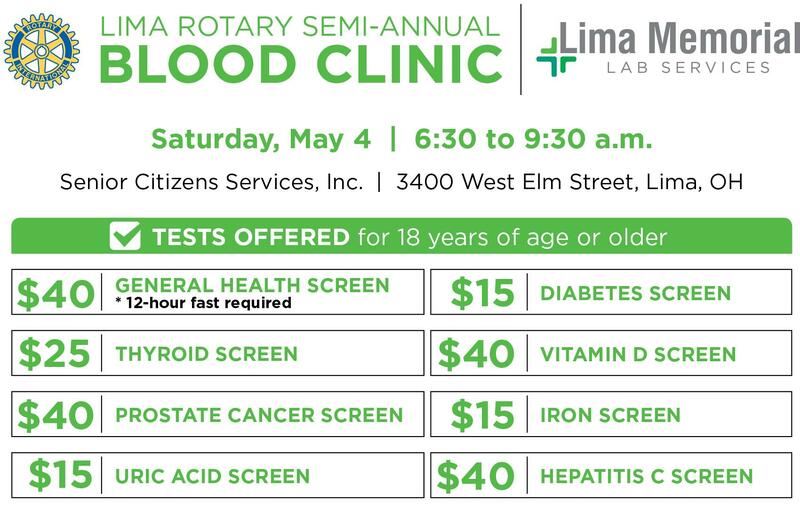 Lima Rotary is the leader in D6600 in these efforts. Thank you for your generosity. The Bucyrus Rotary Club is auctioning off a wine cellar. The Silhouette Professional DWC140D1BSSPR model comes with a 24-month in-home warranty on parts and labor. Installation and yearly maintenance (cleaning) of the fridge are not covered under the warranty. Wednesday, April 10. Please include all contact information needed to finalize the purchase. Individual name and phone and business name and phone if being purchased for a business. Any additional contact information you feel would be helpful. Payment must be made to and received by Bucyrus Rotary Club prior to pick up. Rotary is using mobile phones in its fight to eradicate polio. Early bird registration is going on now for the Rotary International Convention June 1-5 in Hamburg, Germany. If you'd like to attend, see President Paul. Your help is needed to fund the Rotary Rose Parade float.